Feeling the need to stand out in the overly crowded world of event businesses? 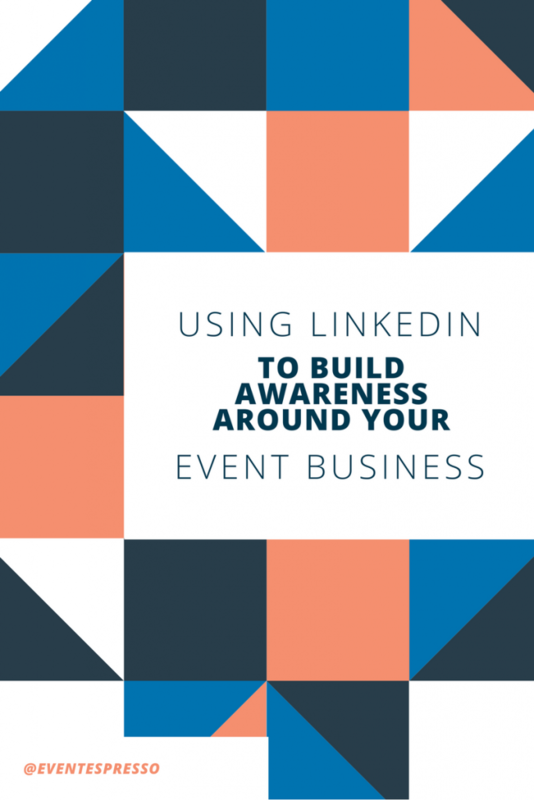 Did you know that LinkedIn can help build awareness around your event business? With nearly 470 million registered users and spread over 200 countries, LinkedIn is more than just a resume-displaying platform. Utilizing LinkedIn for your event business is essential if you want to grow. In fact, it is an often overlooked but powerful marketing avenue for small-to-large event businesses, conferences, and event planners in general. Last week I covered Twitter Marketing in great detail. Be sure to check it out, especially if you to reach a wider audience than what’s on your Facebook Friends List. 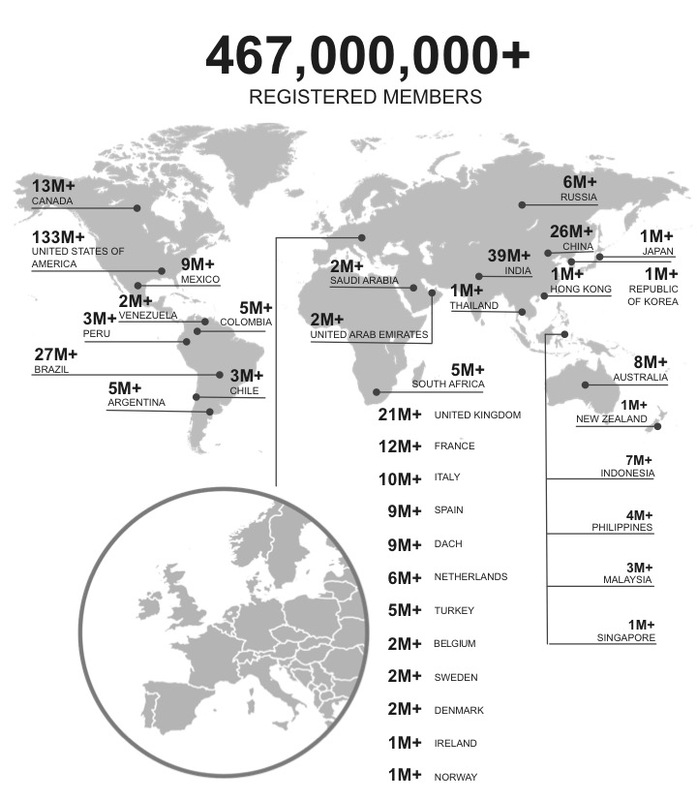 As of 2016, LinkedIn had over 467 million users in over 200 countries and territories, 40 percent of whom check the platform every day. One in three professionals in the world has a LinkedIn account, and 49 percent of primary decision makers use LinkedIn for business purposes. 45 percent of U.S. Internet users with a household income of more than 75,000 U.S. dollars used LinkedIn. The U.S. Census Bureau reported in September 2016 that median household income was $55,775 in 2015. Why is LinkedIn Important to your Event Business? Founded in 2003, LinkedIn is the world’s largest professional network on the Internet. With more than 450 million members worldwide, including executives from every Fortune 500 company, LinkedIn connects the world’s professionals to make them more productive and successful. The company has a diversified business model with revenue coming from Talent Solutions, Marketing Solutions, and Premium Subscriptions products. Headquartered in Silicon Valley, LinkedIn has offices across the globe. There are more than 40 million students and recent college graduates on LinkedIn. They are LinkedIn’s fastest-growing demographic. LinkedIn is currently available in 24 languages: Arabic, English, Simplified Chinese, Traditional Chinese, Czech, Danish, Dutch, French, German, Indonesian, Italian, Japanese, Korean, Malay, Norwegian, Polish, Portuguese, Romanian, Russian, Spanish, Swedish, Tagalog, Thai and Turkish. LinkedIn stands out from other social marketing platforms for one simple fact. It’s the largest professional network on the internet. With over 450 million members around the world, LinkedIn is a sales powerhouse for businesses in the business-to-business (B2B) segment. LinkedIn is especially perfect for an event business as it offers cost-effective ways to market and promote your business. At its core, LinkedIn is a professional social network. It’s all about career development, professional connections, industry discussions and other types of business-related activities. It’s not like other social media marketing platforms, such as Facebook, Twitter or Pinterest, where businesses have direct access to consumers that they can easily market to with status updates, images and other casual posts. LinkedIn is also the single best source of business professional contact information available on the web and can be utilized in various ways. LinkedIn is a database of information, which is why nearly every professional is using it to connect with others. Furthermore, most professionals use LinkedIn for sales prospecting, but there’s clearly potential to use it for other purposes. 75% of the B2B buyers use Social Media to make buying decisions. 50% of B2B buyers use LinkedIn as a source for making purchase decisions. 76% of B2B buyers prefer to work with recommendations from their professional network. Growing your network of potential speakers, customers, and suppliers. Landing event sponsors. As of 2016, 41% of millionaires use LinkedIn. Connecting with other event managers using InMail. You can send InMail messages directly to a professional, asking for information even though you’re not connected. It is the most credible way to message anyone and provides a high response rate. Finding the perfect venue. Many hotels, conference centers, and universities have company pages on LinkedIn. You can use InMail to connect with decision makers. Growing your network of event managers and event planners has never been easier. The LinkedIn Event Managers and Event Planning pages boast a database of over 13 million users with the event management and event planning skills. A Company Page helps LinkedIn members learn about your business, your brand, and company, including any company events and speaking engagements you may have available. LinkedIn Company Pages are also an excellent way to establish industry expertise. For example, the Hootsuite LinkedIn Company Page has more than 155,000 followers tuned into the valuable and timely content we share—and that’s not including the 1.3 million people that follow CEO Ryan Holmes’ thought leadership articles. Think of your company page as a supplement to your event website. A company page helps drive traffic to your site and provides an outlet to promote your content, events, and sell tickets. Your LinkedIn Company Page offers many free marketing opportunities and enhances the overall credibility of your company. Rich content and compelling status updates can also establish your brand as a leader in your industry. You need a company presence on LinkedIn to gain access to the full range of benefits LinkedIn can offer to all event business ventures. LinkedIn allows you to publish job postings, of course, which is perfect for finding experienced speaking candidates in your industry. Use LinkedIn search to reach out to experienced speakers directly and encourage them to present at your next event. Turn your company page into a lead generation tool. Here’s a great post from Kissmetrics that offers seven Advanced LinkedIn strategies for business-to-business marketing. LinkedIn Groups are ideal for engaging attendees, speakers, and sponsors. Making LinkedIn groups a great place to re-share content, get feedback on event ideas, and promote the next event. They are primarily forums and discussion groups of like-minded individuals, entrepreneurs and business owners. LinkedIn Groups is one of the most effective mediums to create conversation and engagement around your brand, service or products. Creating strategic conversations with influential people is what LinkedIn Groups is all about. It is an open discussion forum where engagement is encouraged and expected therefore discussions around products or services should be an open-ended and inviting response. Don’t say things like, “Hey, attend my business event” but rather “Have your efforts to grow your leadership skills been effective?” This question invites engagement and opens dialogue for you, the entrepreneur or sales professional, to respond and engage with the person while building a relationship. It is possible to find Sponsorship through LinkedIn, with a little research of course. No matter what the scale or nature of the event you are hosting, the involvement of sponsors is imperative to make the event profitable. LinkedIn can prove to be an ideal tool to find sponsors for your event. It can enable you to find the right people that can provide the necessary funds required to manage your event and other activities related to the event. Sometimes business owners can’t identify which companies to approach for sponsorship. LinkedIn can be of immense benefit in this regard. Many major players in the corporate world have their profiles on LinkedIn. Therefore, LinkedIn is a very effective way of finding leads. If you are having trouble finding sponsors, be sure to check out the LinkedIn Sponsorship directory, where you can find articles, experts, jobs, and more, to get all the expert insights you need on LinkedIn. Venue Finding is a free comprehensive database that will assist in finding the right articles, experts, careers and more. The results will specialize in the search for the perfect venue and negotiate rates to get you the best deals. You can talk with professionals who have particular skills, read related posts and listen to top presentations in the field. One of LinkedIn’s most underutilized features is the “LinkedIn Status Update” (also called your “Network Update”) in your LinkedIn Profile. The status update is one of the best ways to stay in front of your target audience on a consistent basis. Status updates are typically done by typing a few lines and then copying the URL and pasting it into the status update field – LinkedIn will scan that page for images and allow you to choose which image to show in the update. I’m not going to get into the specifics of updating your LinkedIn status, so here are four ways to update your LinkedIn status, which you can read when ready. If you’ve written articles, blog posts, marketing copy, or posted status updates on Facebook about your events. Make sure you are publishing those same status updates, articles, and marketing copy on LinkedIn. Posting your articles on LinkedIn helps build your personal reputation and increase exposure for your business or website. LinkedIn has many publishing tools available to users at all levels. Don’t pass up an excellent opportunity to grow your network and awareness around your event business. All you have to do is re-share your content on LinkedIn. Since LinkedIn is a professional social network, it should be no surprise that the best times to post are in the morning and early evening. LinkedIn users treat it like a newspaper, so that is why LinkedIn users are most engaged during the morning. Like other networks, the best times to post are still before, and after work. Tuesdays – 7-8 a.m., 10-11 a.m., and 5-6 p.m.
Wednesdays and Thursdays – 7-8 a.m. and 5-6 p.m.
Download The Sophisticated Guide to Marketing on LinkedIn. Everything you need to know about marketing on LinkedIn, written both strategically and for instructional purposes. Create a LinkedIn Showcase Page for your event brand. Showcase Pages are extensions of your Company Page, designed for spotlighting a brand, business unit, or initiative. Create a page for aspects of your business with your messages and audience segments to share. Enhance your social selling efforts with LinkedIn Elevate, a tool that enables your employees to share approved content with their network. LinkedIn Elevate is a paid employee advocacy platform that makes it easy for employees to become social professionals. Use LinkedIn SlideShare to embed all of your event presentations, PDF’s, and videos directly onto your LinkedIn profile. When someone views your profile, they can immediately see the content attached to your SlideShare profile. Use the LinkedIn Sharing Bookmarklet to quickly share web pages with your professional network and groups straight from your browser even when you’re not on LinkedIn. 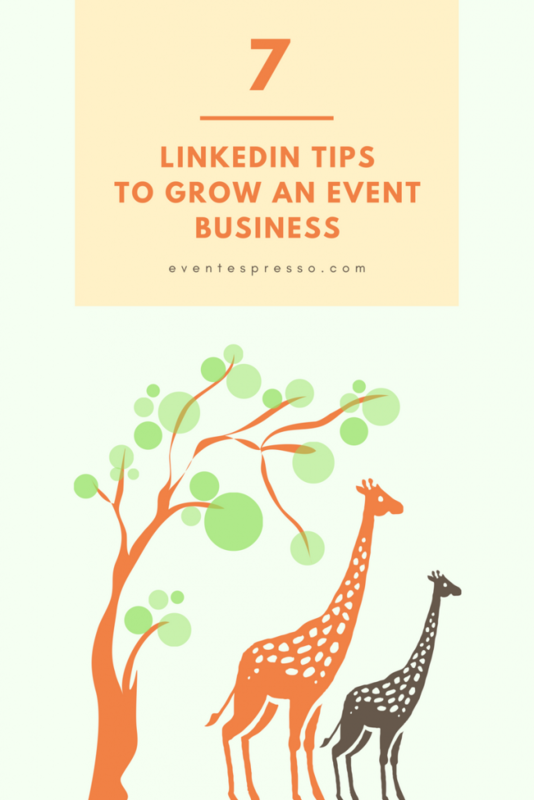 If you’ve made it this far, you are aware that LinkedIn is a very powerful platform for growing the reach of your event business and attracting new sponsors or attendees to your event. It also presents a terrific opportunity to stay top of mind with your employees, customers, vendors, sponsors and people of influence in your event niche. Do you currently use LinkedIn to market your event business? What are some of the tactics you use? Share your tips with us in the comments below.